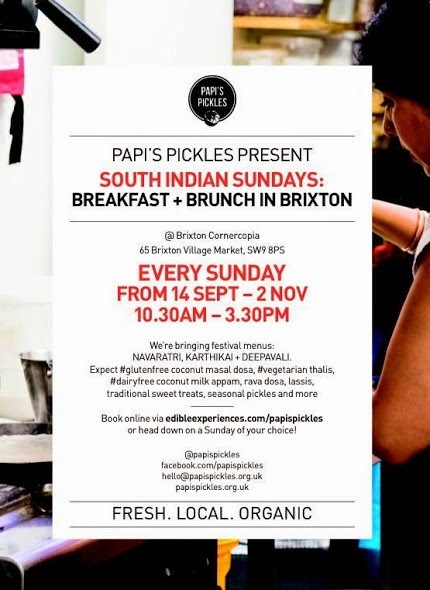 The incredibly popular Papi's Pickles Indian Brunch is coming back to Brixton Cornercopia, in Brixton Village, for a series of Sundays, between 14th September and 2nd November. Prices vary depending on date and option, but all are below £10 (although bring extra for coffee, alcohol and more. "Papi's Pickles are heading back to Brixton! We're delighted to be popping up at Brixton Cornercopia, an ultra-local restaurant and deli, every Sunday from 14 September to 2 November with our fresh South Indian breakfasts and brunches. We're bringing rotating festival menus, designed around the auspicious festivals of Navaratri, Karthikai and Deepavali. Expect #glutenfree coconut masal dosas, #vegetarian thalis, #dairyfree coconut milk appams, rava dosas, lassis, traditional sweet treats, seasonal pickles and more. Check the date for the specific menu on offer, tickets are available for sittings at 10.30am (breakfast) / 11.30am (breakfast) / 12.30pm (brunch) / 1.30pm (brunch) and some tables will be available on the day until 3pm. Let us know if you have any dietary requirements or allergies, which we will do our best to cater for. Coffee roasted in Camberwell, teas grown in England, soft drinks, alcohol and homemade sweet lassis flavoured with rose essence will be available to buy on the day. Please bring cash only to pay for these. We're really looking forward to feeding you this autumn!"